Initially I was set on entering academia. However, as my course progressed, I began to feel that I would enjoy being out in the field much more. In the end I opted for marine conservation where I get to apply the knowledge that I've learned to real life situations in local communities. I don’t think one route is better than the other, but this one suited me better. I went straight into environmental education in field trips in Singapore and was there for a number of years teaching conservation issues and, in particular, about the problems our oceans are facing. I began to get frustrated that all I was doing was raising awareness (though that in itself is essential to conservation) and I wanted to contribute more directly to positive changes in the world. I moved to my mother’s homeland of the Philippines and started volunteering in different conservation projects to get a better idea of what it was I wanted to do. 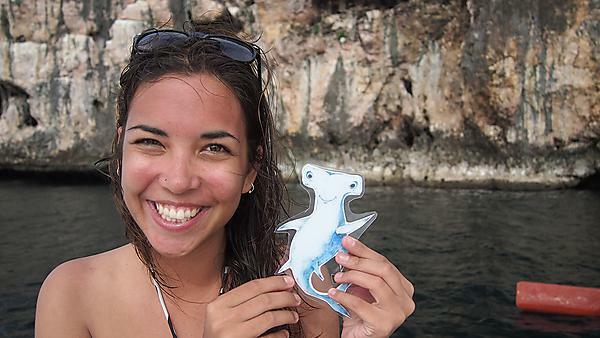 I worked as a research assistant studying thresher sharks in Malapascua as the Principle Investigator on a project monitoring the effects of feeding on whale sharks in Cebu. But my most rewarding volunteer experience was with Zoox, who run a marine conservation experience programme focused on the professional development of their volunteers whilst supporting high-impact conservation projects. I did really well as a volunteer and they decided to keep me on! I'm now the Programmes Officer and have been helping to develop and shape the growth of the company and its partner conservation project. Through volunteering and now working for Zoox, I've been able to come to terms with the fact that straight-up Science wasn't what I wanted to do, but that my degrees have given me that foundation with which to succeed in conservation. It’s all about people. The connections you make, the way they perceive you as a professional, and the quality they perceive your product to be. The only way to improve is to get experience! Get as much experience as you can: in the field, in the lab, assisting with research projects. Volunteer for outside organisations and apply the knowledge you’ve learnt whilst it’s still fresh. Any experience you get whilst you are studying puts you ahead of others applying for work after you finish your studies. It will teach you things you don’t even know you are being taught. Well worth skipping a couple of nights out for. I had always wanted to do marine biology, and the content of this course seemed well rounded and super interesting. At the open day John Spicer, my future tutor and now a Professor, was enthralling – I wanted to be taught by someone who clearly had such passion for marine biology and shared his knowledge. Although other really similar courses had more exotic field trips, I still got to go to France and Portugal as part of my course (which was also a great seller). I was incredibly lucky to be able to work with the Marine Biological Association for my undergraduate dissertation, and Plymouth Marine Laboratory (PML) for my masters project. For my MSc, I spent a lot of time in a lab looking at the effects of ocean acidification on the population dynamics of a specific clade of bacteria. It was fantastic fun, and I learnt so much from managing my own project, and from the people in PML, particularly my supervisor who really took on a mentoring role. Lessons I learnt from him have stuck with me to this day. One of the things I loved about Plymouth was the laid-back atmosphere. Back when I was studying my degree Drake’s Circus hadn’t even been built yet, and it felt like a sleepy city by the sea that had a lot of beautiful areas to visit nearby. Little road trips were definitely a plus, and I felt like it retained its charm even as it grew over the years I was there. Study what you’re interested in: it gives you that hunger to learn. The course itself was great; I really loved my third year – getting to choose the modules that interested me. You were then at the stage academically to really dig into the nitty gritty of marine life. Studying at Plymouth was a happy accident. I had my heart set on another university closer to home, but my mother insisted I at least go to the open day after the marine biology course was highly recommended by a family friend. I spent six hours getting to Plymouth for the open day and instantly fell in love with the place: the weather was fantastic and, I'm not going lie, it made a difference!